Hi everyone! I know I’ve been scarce here lately, but I appreciate your patience. Blogging doesn’t quite pay the bills (maybe one day, huh?) and my job has me traveling all over the state this month. In the past three weeks I’ve been to Florence, Jacksonville, Tuscaloosa, Mobile, Dothan, and Montgomery. But, we’re almost finished and I couldn’t be happier. I am slap worn out!! Dredge chicken in flour mixed with salt. In a skillet over medium heat, cook chicken in oil until golden; drain. Transfer chicken to a slow cooker. Mix lemonade, brown sugar, catsup and vinegar; pour over chicken. Cover and cook on low setting for 6 to 8 hours, or on high setting for 3 to 4 hours. Remove chicken to a platter; keep warm. Whisk cornstarch into cold water; add to juices in slow cooker. Cover and cook oh high setting to desired sauce consistency, about 15 minutes. Serve chicken with sauce. Makes 6 servings. Combine boiling water and bullion cubes; stir until dissolvedand set aside. Melt butter in a heavy skillet over medium heat. Add uncooked rice to skillet; cook and stir for one to 2 minutes. Add bullion mixture to rice; reduce heat. Cover and simmer for 20 to 30 minutes, until water is absorbed. Add reminaing ingredients; stir and heat through. Makes 8 to 10 servings. While the Lemonade Chicken was good, I think my slow cooker got too hot and scorched the sugar in the dish, so it ended up with a bitter flavor. But, the center of the chicken was moist, tangy, and delicious. I think next time, I’ll cook it for a much shorter amount of time. 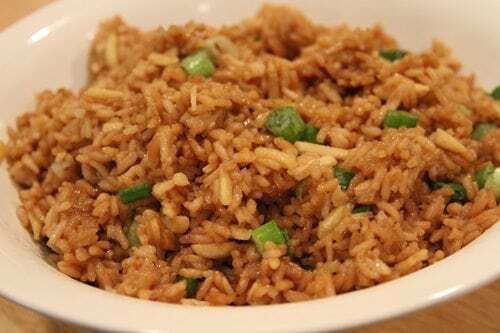 The Easy Almond Rice was the real star – my family is already asking for it again. It was savory and delicious and the almonds gave it a great crunch! We really enjoyed it as a great easy alternative side. I’ve got my eyes on a few other recipes in this cookbook, so I know you’ll find something you love in it too. Be sure to check out Gooseberry Patch on their blog, Facebook, Twitter. Now, to enter to win your own copy of this great cookbook, simply leave a comment below. You all have until February 1st at midnight CST to enter to win. One comment will be drawn at random as the winner. These recipes look yummy! I’m gonna try them, and I would LOVE to win the cookbook!! Love your blog! Arrives every afternoon around 4 pm and gives me ideas for dinner. The sample recipes look delicious! Would love to have one of the cookbooks. Always room in my bookcase for a new cookbook – if not, then I’ll get a new bookcase! Thanks for sharing the recipes. Love the recipes and would surely love to win the book.ThANK YOU! I’m always looking for great recipes that aren’t so time consuming. Looks like this cookbook fits the bill! I would LOVE to win a copy!! I have a few Gooseberry Patch’s cookbooks and think they’re great.Very easy to understand and the ingredients are not hard to find.Would love to have this book. the almond rice sounds good!! i like my rice seasoned, tasty! Love the cookbook and love the recipes. Can’t wait to try them. Put me down to win that bood. I’m always happy to have another chicken recipe. Can’t wait to try it. I would love the cookbook…The almond rice sounds great. The recipes you post are becoming very popular here at the office… Deviled Ham this week and next week for a birthday breakfast for the boss’s wife, Sticky Pecan Cinnamon Buns! Yum! My family would love the lemon chicken…and I love getting new cookbooks! Oh please add me to win this! I love quick recipes! Love your blog, would love to win! The recipes you chose sound very good. I can always use another cookbook. Keep up the good works. Hi, Stacey! Hope your 2012 had started off to be a great year. I collect cookbooks. Would love to win this one. I’ve heard great things about it. I think both dishes look yummy,especially the chicken. 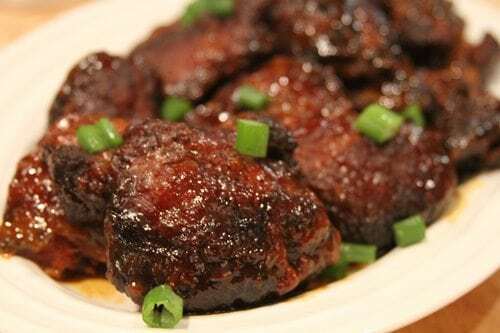 Yummy recipes – great picks. Would love to win the book. Looks great. Would love to have one. The Lemonade Chicken sounds great, I would love to win this book! I would love to have this! I need all the quick meal ideas I can get! Will try these recipes – they sound so good! Would love to win the cookbook! I love Gooseberry Patch cookbooks. They are beautiful! Not to mention the yummy, easy recipes! I’m such a rice lover so will give that one a try. Right now I’m about “chickened out” so will hold on that one. Gooseberry does have fab recipes and books and I love their sideline comments! Thanks to you both! Doesn’t coming to Auburn appeal to anyone outside of football season, lol??? I love Gooseberry Patch! Would love to add this to my collection! Hope you get to spend some time at home soon! Love your blog in Atlanta! Really enjoy your blog , and all the wonderful recipes you share with us…..
WOW! I love these cook books and would love to include this one in my collection. The two recipes you tried look and sound soooooooooo good. I can’t wait to try them. Thanks for putting them on your blog today. I do my shopping on Thursdays and have already included the needed items to my shopping list. Thanks again for giving us a chance to win this book. I have been needing a new chicken recipe or so my 9 year son says! This will be a welcome change because I was just thinking I needed a new version of lemon chicken! Thanks! Love your blog and useful tips! These recipes look so good. Thanks for chance to win. I’m always looking for quick recipes & I love Gooseberry Patch. Would love to win this book. Also looking forward to trying their new “Our Favorite Recipes For One Or Two” & I just downloaded “Quick & Easy Family Dinners” free to my Kindle app. I think I’ll try the almond rice. Sounds interesting. I enjoy your blog. I made your Hershey Bar Pie and Garlic Herb Knots recently…both were great! I will be making this tomorrow for dinner!!! Love the Gooseberry Patch books, always find great ideas!! Thanks!!! I do not have a slow cooker. Would you recommend the oven at 300 degrees for 3 hours? Thank you. Sorry, I am referring to the Lemonade chicken. I LOVE all Gooseberry Patch Cookbooks!!!!! YUMMY – Looks delicious. I would love to win the cookbook. Love trying new recipes. I LOVE to cook!!!! What can I say, I am a cookbook junkie. I would really like to win this one! Thanks so much,I can’t get enough slow cooker and rice recipes, looking forward to these yum! These recipes sound absolutely delicious. Can’t wait to try the Lemonade Chicken and Rice… Thank you for the opportunity to win this great cookbook! I love “Gooseberry Patch” cookbooks. 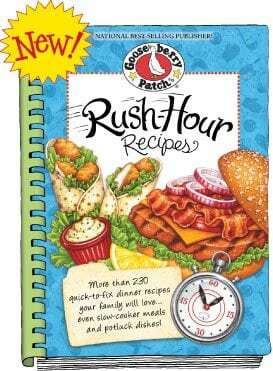 They have some delicious recipes and this cookbook sounds awesome for rush hour cooking. Love your site and I think I will be making the almond rice soon for I love all kinds of rice dishes. I just made the Almond Rice and it was excellent. I think it will become one of my favorites too. Love Southern Bite!!! I can’t wait to try the rice dish. While the chicken does look yummy, I’m trying to stay away from fried foods. Thanks for your blog to help stir up some excitement in my kitchen! Can’t wait to try this. Sounds like a good Sunday dinner. Both recipes look like they would be delicious. Must try both today. Rush hour recipes would be right up my alley for week night meals. The almond rice sounds good too. Normally not a fan of rice but this sounds much better than plain buttered rice. I will probably use brown rice tho. I like the sounds of the lemonade chicken but will probably bake in the oven instead of putting in the crock pot. When I cook with a crock pot or slow cooker everything seems to come out mushy, burnt or just doesn’t taste good. Thanks for the good ideas, then adjust to our families likes to make it my own! The Lemonade Chick sounds delicious and I bet it would taste just as good with orange juice concentrate as well to give you a taste similar to Orange Chicken found in a Chinese Restaurant. Thanks for sharing and I cannot wait to try them!!!! Lemonade chicken sounds wonderful! Can’t wait to try both of these. The chicken sounds great. The rice looks really good too. I have several of Gooseberry Patch cookbooks and enjoy them. I’m a cookbook collector. I WILL be making the lemonade chicken for our next church potluck, and my 6 yr old loves rice so, I know he will like the almond rice.Luv this site. I love Gooseberry and have many of their cookbooks and craft books. Well, I’m not familliar with Gooseberry Patch. I will definately have to check that out. The chicken sounds and looks delicious! That lemonade chicken looks really good, and it sounds like you were in my hometown this past month! Glad you’re home and cooking again. Both recipes look delicious! Appears to be a cookbook I need to check out! like a truly nice guy!!! Keep up the good work. I cannot wait to try the Lemonade Chicken. It looks wonderful! Wow, can’t believe I’m adding a comment to try to win another cookbook. But the lemonade chicken does sound good and the rice too. The Lemonade Chicken sounds and looks really good! Both recipes look great! Have been wanting to get this cookbook. Hope I win! The Gooseberry Cookbook looks great! I hope to win! LOVE COOKING BY VARIOUS RECIPES, SO I CAN SHARE AND ENJOY EATING THE MANY DISHES I PREPARE!! Both recipes sound great! The Almond Rice may be on the menu tonight! Great giveaway! Thank you and Gooseberry Patch! Does the Lemonade Concentrate have to be thawed in order to be mized in with the other ingredients? The food looks wonderfully delicious! Aren’t you the lucky one? It would be great to be the lucky winner. Thank you! Gooseberry Patch has sooo many wonderful cookbooks it’s hard to choose !!! The chicken looks great too !! I love the Gooseberry cookbooks and I can hardly wait to try these recipes. Can hardly wait to try these recipes. Looks and Sounds DELISH! Great giveaway; thx for a chance! EXCITING! Ive been a fan of Gooseberry Patch for years ! Always great recipes and gifts,and a joy to read! Ive been a fan of Gooseberry Patch for years ! Always great recipes and gifts,and a joy to read!Amust have! A new cookbook for my collection would be wonderful. I love Gooseberry Patch!! The Lemonade chicken lokks so, so good! Can’t wait to try it!! Yumm!! Love the Gooseberry Patch’s cook books. Got to try the lemon chicken. Love your site. Sounds interesting. Would love to try to book! Sounds interesting. Would Love to try the cook book!! !